A brand new UK music chart will launch on Monday dedicated to the most popular tracks on streaming services like Spotify, Deezer, Napster, We7 and more. The Official Streaming Chart will tally up the top 100 songs each week, using data from the UK's most-used streaming services. The chart will represent the first time that the likes of Spotify, an increasing revenue stream for artists and labels have been considered by the Official Chart Company. Plays ChartsNow, a new start-up and the Zune platform from Xbox LIVE will also be included, while plays from ad-funded and subscription-based services will all be counted. The Official Chart Company says 2.6bn songs were streamed in the UK last year and the chart will bring these services the recognition they deserve for changing the musical landscape. Managing director Martin Talbot says, “This is a true coming-of-age moment for music streaming in the UK. Services such as Spotify, Deezer, Napster and We7 have been building their audiences over the past few years and are now delivering millions of audio streams every week to hundreds of thousands of music fans. For the first time, from next week, we will have transparency on exactly what they are listening to on these new services. 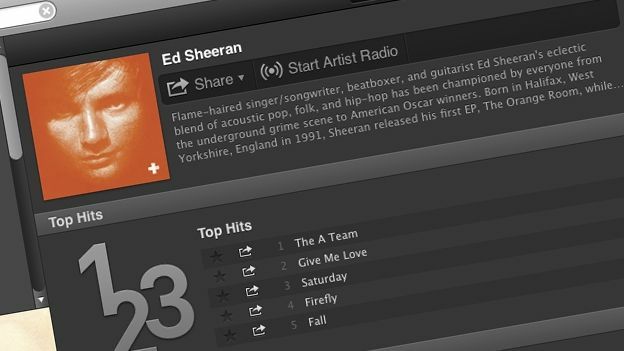 To celebrate the launch, the organisation revealed Ed Sheeran to be the streaming king of 2012 so far, with the likes of Lana Del Ray, David Guetta, Rihanna and Coldplay bringing up the top 5. The most streamed track of 2012 so far, quite depressingly, is Somebody That I Used To Know by Gotye.